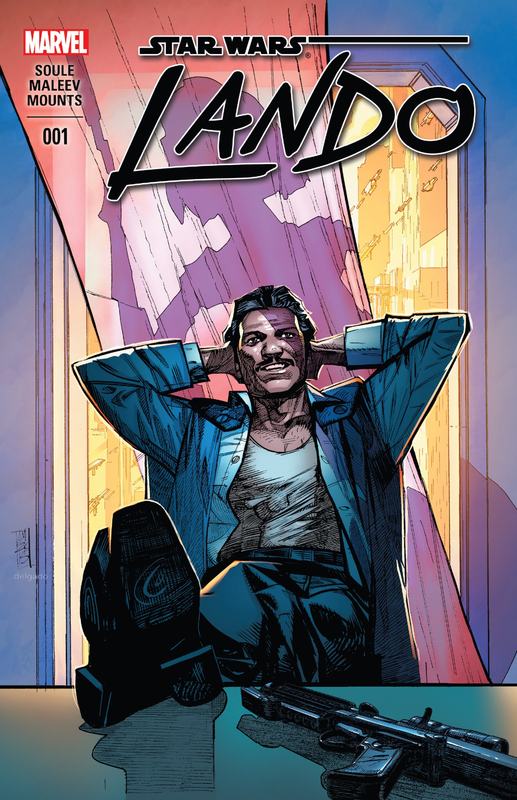 A new comic series for Lando Calrissian has arrived, and it’s about damn time. I say this not so much about Lando being one of the many staples of Star Wars pop-culture, but for something fresh and different in our intergalactic male-protagonists out there. We got enough of the usual stereotype of mercenaries, soldiers, ex-soldiers, space-wizards, etc. shooting and swinging around. The galactic storytelling frontier needs more scoundrels, tricksters, persons looking to beat the system not through guns and laser swords but with brains and style. What I like about Lando here, is him as not necessarily the hero type. There is one inside of him, as he has a conscious and a drive to not see others suffer as a result of his actions. But, he is still a man who seeks a better way in taking chances by climbing the social ladders, making deals, paling with Sith Lords. He does not always win. After all, movie fans know he lost his Millennium Falcon, Cloud City, and probably more. But, they know he gains from it too, with Rebellion glory a bit later. The comic starts fresh, reintroducing his character through an intimate moment, as Lando explains his true intentions to a high-ranking Imperial woman. Rather than simply steal an item or go off running, he feels the need to explain himself to a woman who may have felt more for him than realized. There is an odd sort of fairness to make things right, but also take a gamble in that. Is there more to this moment? Perhaps there is more, as that scene cuts off to the main story of the issue. 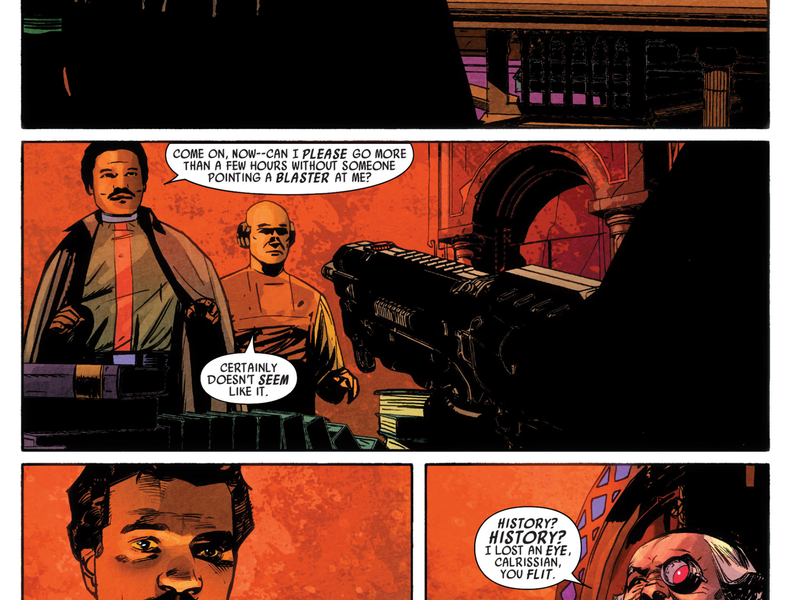 Throughout the book, we get more of this side of Lando; man driven to succeed and looking for himself. Yet, there are consequences, as Lando strives for balance in his lifestyle, as he looks to the present future one day at a time. The fun for us, is this crazy setting of a galaxy under tyrannical rule which establishes a sense of order but still allows for organized crime to continue. If someone is going to get hurt from one’s success, we hope it’s the right people. But unlike Lando’s comic version from film, we have a nearly different character in Lobot, the headplant wearing man who we met briefly in The Empire Strikes Back. From there, we see only a man who takes orders and mute, almost robotic . Here, we have something far more human and sentient, with opinions and a little dry wit. Lobot is now a fellow comrade with a more fleshed out relateable every-man to his demeanor. A bro, perhaps. The overall story is nothing major or on the epic scale just yet. However, we do get some interesting moments, as Lando puts himself in constant danger. He sort of welcomes it, and takes chances. To put the odds in his favor, he uses words and takes on ideas. This leads to some unwanted attention at the very top of the Imperial order, as revealed at the end. 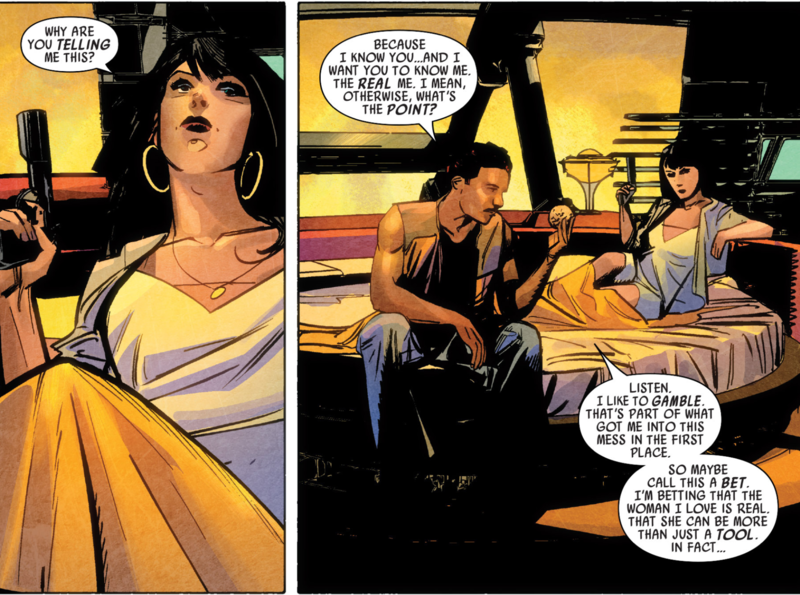 The pencils, inks,and colors are fantastic, for this type of storytelling. a galaxy under Imperial rule can be cold, unforgiving. So, we have a lot of darkness and dirty colors. Yet the settings of fantastic, otherworldly architecture and vehicles are all over, reminding of the grandness of the Star Wars universe..perfect for venturous gambler and scoundrel types. So, I think this is a great opening issue to an intriguing character. But, hard to foresee if this series will be powerful or lacking. It has a lot of potential, with a fantastic character to explore for our Star Wars fans and casual science fiction lovers. That’s enough for me..